In Leon Frazer’s Quarterly Review for the second quarter of 2013, optimism was expressed about the performance of the equity markets. At the conclusion of the third quarter that optimism appears warranted. 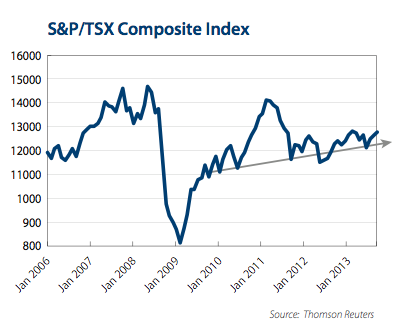 During the third quarter the S&P/TSX Composite Total Return Index was up 6.3% and a healthy 5.3% year-to-date. Consumer Discretionary and Financials were the best performing sectors in the third quarter, led by Banks, up almost 10% on average. The US market under performed the Canadian market during the quarter, with the S&P 500 Total Return Index up 5.2% in the local currency and up only 3.2% in Canadian Dollars. Bond yields continued to rise. Virtually all bond indices with maturities over 10 years are in negative territory year-to- date. We continue to stress the importance of the slow, steady performance of Canadian dividend-paying equities as the core basis for portfolio returns going forward and short duration fixed income as a complement, if necessary. It was an eventful summer for the Canadian market. The Telecom sector regained much of the performance lost on the June announcement that Verizon was contemplating an entrance to the Canadian wireless market. When those rumours turned out to be false in September, many Canadian investors who panicked and sold their shares during Q3 found themselves missing the quarter’s 6% total return from the sector, including dividend income from Bell, Rogers and Telus. Oil prices increased to their highest levels in over a year, with escalating tensions in the Middle East combined with tightness of refinery demand in North America fuelling much of the $10 rise. It is important to note that Canadian benchmark heavy oil prices also improved dramatically in the quarter as transportation bottlenecks started to ease and incremental heavy oil refining capacity began to come online. In an unexpected turn of events, Russian potash giant Uralkali rocked the boat with their decision to abandon ties to their Belarussian partner, causing temporary downward pressure on fertilizer stocks, including Potash Corp. of Saskatchewan, one of our newest core holdings. It appears the alliance will be resurrected in some form in the not too distant future, but uncertainty remains. Finally, we watched from the sidelines as Prem Watsa’s $9 bid for the embattled Blackberry brand signaled the somber beginning of the end for Canada’s latest technology bust. The fourth quarter is shaping up to be quite lively as well. We began the month of October with the entire US government shut down, an event which is costing billions of dollars and precious time as the government heads into contentious negotiations on the debt ceiling, amongst other things. At the same time, the global economy continues to accelerate, as economic indicators in Europe and China become more positive as the months pass by. The US Federal Reserve awaits some resolution from the US government on fiscal policy before deciding whether to begin the withdrawal of quantitative easing stimulus, a prudent step in our view. Overall, despite elevated headline risk, we are optimistic about a positive end to the year for the Canadian market and thus our clients’ portfolios, given dividends alone will contribute approximately 1% of total return in the fourth quarter. Throughout all this volatility, our clients’ portfolios continue to march ahead and our long-term economic thesis remains intact. As a refresher, we have been consistent in our view that the economy will continue to slowly grind on, despite periods of both positive and negative volatility. Since 2009, exceptional government stimulus kept the economy afloat while consumers repaired their personal finances. Like some of our more positive counterparts, we believe the economy is reaching an inflection point where stimulus can be withdrawn due to tangible underlying economic strength. However, higher interest rates, energy prices and taxes will constrain that growth and keep it in a low, single digit range for the foreseeable future. It is interesting that the Canadian market has followed a slow growth trend line for the last several years (see chart), save for a brief liquidity-induced rally in late 2010. Given this backdrop, we continue to strive for 6-9% long-term average total returns before fees in our portfolios, as long as inflation remains in check. We feel confident in our ability to deliver, especially since 40-60% of that return is locked in with the current level of dividends growing every year. Over 70% of our core holdings have increased dividends so far in 2013, by a weighted average of almost 6%, as companies signal ongoing strength in their businesses.